The Phorus PS10 is the first DTS Play-Fi enabled wireless speaker with Amazon Alexa Voice Service. The $250 tabletop speaker targets would-be Amazon Echo buyers with audiophile ears thanks to its support for hi-res audio 24-bit/192kHz music streaming. With the inclusion of DTS Play-Fi technology, the PS10 can connect to more than 200 DTS Play-Fi-compatible products to form an Alexa-powered whole-home audio system, regardless of brand. The Phorus PS10 is powered by a built-in 30-watt amplifier with DTS Sound post processing, two 65mm Neodymium full range transducers, and two four-inch bass radiators in a sealed enclosure. The PS10 supports playback of high-resolution audio files wirelessly via DTS Play-Fi technology and features four hard button music station presets, allowing for easy, one-touch access of a user’s favorite streaming music stations. The Phorus PS10 supports playback through Airplay, and Spotify Connect, includes a 3.5mm input for connecting any analog source, and a line-level audiophile grade output for connections to high-performance audio components. Using DTS Play-Fi, the 3.5mm input can be streamed wirelessly to DTS Play-Fi enabled products in other rooms of the home. The line out features variable volume output control and a Wolfson high-resolution DAC for improved sound quality. Additionally, the PS10 will support Amazon’s Connected Speaker API with a future firmware update. This will enable the PS10 to select and control the playback of music on all DTS Play-Fi enabled speakers throughout the home. DTS Play-Fi technology enables lossless multi-room wireless audio streaming from the world’s most popular music services including Amazon Music, Deezer, iHeartRadio, Juke, KKBox, Napster, Qobuz, QQ Music, Pandora, SiriusXM, Spotify and Tidal, thousands of Internet radio stations, as well as personal music libraries, on any supported product. It should be noted voice controls only work with streams started or originating from Alexa Voice Services. 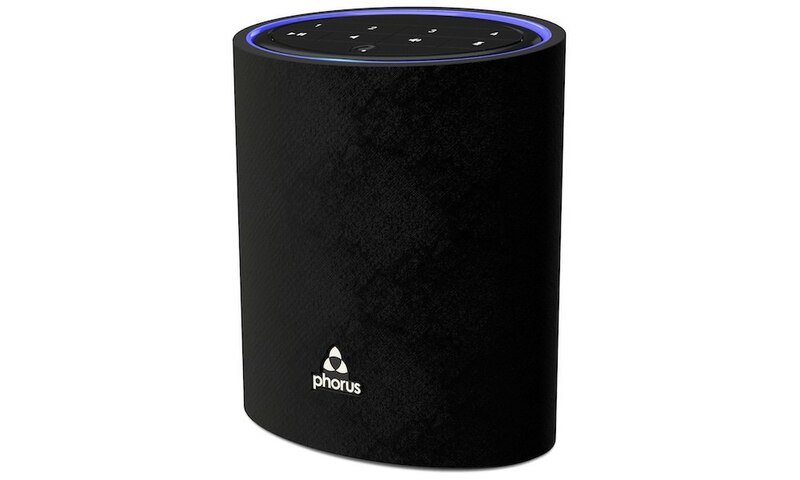 Phorus PS10 with Amazon Alexa Voice Service is available now for $249.